Deus Ex: Mankind Divided is out today. It’s good! And like other games in the series, it gives you a lot of options in how you want to play. It’d be easy to feel a little overwhelmed at first. Which augmentations are best? Which playstyle is the most rewarding? How do you easily make a bunch of money? Never fear, fellow cyber-augmented stealth soldiers. I’m here to help. Consider playing on the highest difficulty. “Give me Deus Ex” isn’t actually that hard a difficulty, particularly not as you unlock more and more augs as you play. If you want a chill time, go with the middle difficulty. But I recommend starting the game on the highest difficulty, particularly if you’re already familiar with this kind of game. At the start, take the tranquilizer rifle. At the start of the first mission, you’ll be given an option as to what kind of weapon you want. Choose the “nonlethal” and “ranged” dialogue options and you’ll be given the tranq rifle. It’s not that it’s that much better than the other options, and picking it doesn’t lock you to any playstyle. It’s mostly just that in experience, the tranq gun is less common than the other types of gun in the game, so it’s harder to get another one down the road. Near the beginning of the game, Jensen’s system gets scrambled and he has to reset his augmentations. You’re given a bunch of praxis points to spend as you see fit. Assuming you’re playing the game with at least some kind of focus on stealth, here are the augs to focus on. Smart Vision: You should use this aug constantly to scan your surroundings and find loot and hidden entrances like grates and vents. I map it to down on the D-pad. Glass-Shield Cloaking: Useful in a pinch while sneaking, and great for bypassing laser grids. Pro Tip: It drains your batteries extremely slowly if you stay put, which can be useful in a pinch. I map it to up on the D-pad, since I use it sparingly. Then, focus on augs that let you get in places. Hacking capture. Level up to at least level 3 or 4 and plan to quickly get to 5. Focus on stealth and fortification as a secondary concern, the most important thing is being able to at least try higher-level hacks. Cybernetic Leg Prosthesis 1 (Jumping). The high-jump is extremely useful for accessing out-of-the-way vents. Get it at the outset. Optimized Musculature. Don’t worry too much about the aug that lets you punch through walls, at least not initially, but do get the aug that lets you pick up heavy stuff. 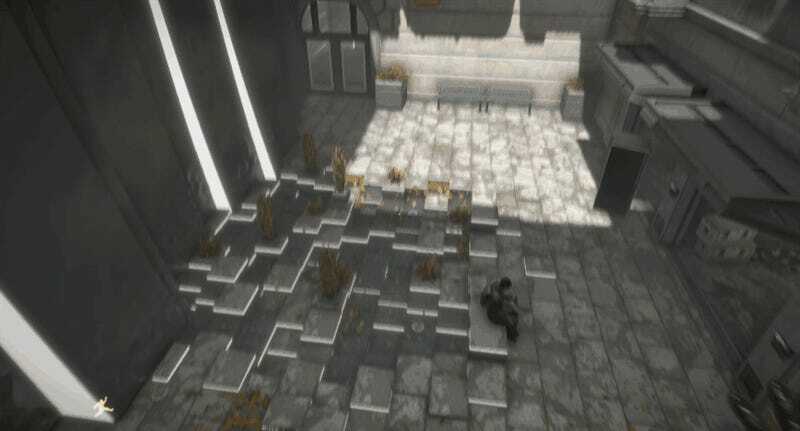 The game puts a lot of secret entrances behond heavy crates and boxes, and you’ll be glad you can pick those up. Remote hacking. Most of the new experimental augs Jensen gets aren’t actually all that exciting. They mostly do things that weapons or other tools already do, or that you don’t need. Remote hacking, however, is very useful. Unlock it early on and you’ll find your options for stealth opening up significantly. Grab second-tier augs when you’re able. These augs aren’t as crucial as the top tier augs, but can still be useful. Inventory Space: Buy at least one inventory upgrade near the start, and periodically upgrade your space as you go. You can carry around more valuable guns while on missions, which means you can make more money afterward. You should have a maxed-out inventory before too much time passes. Implanted Rebreather: There’s a fair amount of green poison gas in the sewers under Prague, so at some point it’ll be a good idea to buy the aug that lets you breathe in that stuff. Icarus Landing: you can always just walk down, but it’s nice to stop having to worry about taking fall damage. Icarus Dash: While not as fun as Dishonored’s Blink ability, it’s still fun to use and can help you get to hard-to-reach places. There are a few augs that just aren’t worth getting until you have so many Praxis points that you don’t have anything else to buy. In my opinion, those are: Flash Suppressant, Leg Silencers, most armor and gun augs (unless you’re hell-bent on going in guns blazing), Noise Feedback, Tesla, P.E.P.S., Focus Enhancement, Mark-Tracker, and Titan, among others. I also don’t really think it’s worth upgrading your Energy Converter, since I spent like 85% of the game working with the endlessly refilling bottom bit of my energy reserves and saved up a ton of batteries for emergencies. Break in everywhere you can. 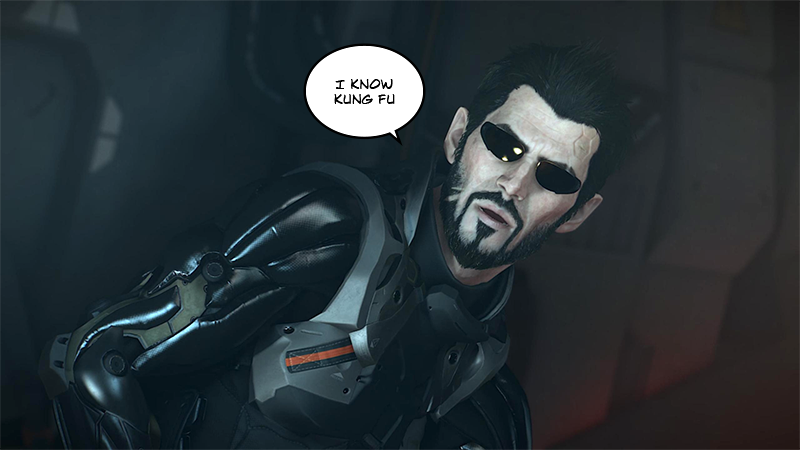 Adam Jensen may be a skilled counterterrorism expert, but his real strength lies in cat burglarly. No place in Prague is safe from his sticky fingers, and that’s as it should be. If you see a locked door, chances are you’re supposed to see what’s on the other side. And unless someone is directly watching you inside their space, you can safely steal anything you want with no repercussions. Rob everyone blind. It’s what god (aka the game designers) intended. Sell off weapons one at a time. You can get an aug that lets you break down weapons for parts, but I’d recommend selling them instead. Weapons are some of the most valuable items in Mankind Divided, which is nice, since there are so many of them around. My advice: Pick a playstyle early on and focus it around one or two guns. Every time you pick up a gun you don’t use (or ammo for a gun you don’t use), go sell it. If you pick up a duplicate weapon type it’ll break down into ammo, so the faster you can sell off your guns, the more money you can make. This is particularly helpful when exploring Prague, since there are lots of weapons lying around, and plenty of armed dudes patrolling right near vendors. If you knock out three dudes and they all drop the same gun, pick up each gun, then go sell it, then get the next one, sell it, and so on. It takes a bit of extra time, but your bank account will thank you. Don’t buy guns or ammo. Buy Praxis kits from the vendor in Jensen’s apartment complex. The guy in Jensen’s Prague apartment is kind of a jerk, but he’s got two praxis kits for sale. They’re expensive, but they’re also just about the only thing worth buying at a shop. Sell off guns and save your pennies, and eventually you can have two praxis kits you wouldn’t have had before. The assault rifle can double as a silenced sniper rifle. The assault rifle can be fitted with a silencer, a 4x scope and can fire in semi-auto mode, which turns it into a mean little silenced sniper rifle, should you want one. Both the sniper rifle and the new marksman rifle can’t be fitted with a silencer, which means that if you’re going to use them, you’ll have to go loud. They also take up a ton of inventory space. Stick with an AR (provided you’re playing at least somewhat lethal) and you’ll have everything you need. This probably goes without saying, but focus on completing sidequests before you do main quests that move the story forward. The game will be very clear about telling you when you’re about to leave and miss out on any uncompleted sidequests, but all the same, better to just focus on them first to begin with. Seek out every point of interest. Right outside of Jensen’s apartment, there’s a guy who will clue you in to a few good points of interest in exchange for Neuropozyne. When you get some, trade it to him. (Remember, Jensen doesn’t need the drug even though all other augs do.) You can always find everything on your own, but it’s helpful to have his tips guiding you. Find ways to limit yourself. No quickloading out of tough situations. If something goes wrong, you have to live with the consequences. You can save your game in case you get killed, but no loading out just because you aggro’d a cop or failed a hack. Figure out another solution; the game will give you options. No radar or objective markers, at least during missions. It becomes far too easy to spend your time staring at the minimap in the corner of the screen and chasing the gold waypoint on your HUD. Go into the “gameplay” section of the options menu and turn off your radar and objective markers. Set UI elements like health, ammo to do a timed fade. You can also do this under gameplay options. This isn’t actually a limitation but it does un-clutter your screen. No Multi-Tools. I think multi-tools are a little bit of a cheat, and recommend not using them. Hack in or find the password. Auto-hacking’s for amateurs. Don’t install the social enhancer aug. Instead, pay attention to whoever you’re talking to and see if you can pick the right responses without any cheats. The aug is pretty cool, but you can always use it in New Game Plus. You could also try restricting yourself to a single weapon, or melee attacks only, or really anything you want! Get creative. Remember a few helpful controller shortcuts. Hold X + RB = Change grenade type. Hold X + LB = Change ammo type. Press X + RT = Switch between two most recently used weapons. Once you unlock Icarus Landing, do it as often as possible. Why take the stairs when you can float down to earth like a golden cyber god? Why, indeed. Slow down and read emails. In your explorations, you’ll come across countless computer inboxes and read countless emails. It’s easy to just skim through these, but some of the game’s coolest stories are contained within emails. Take the time to really read them and internalize who’s writing to whom; it’ll make those little stories make a lot more sense, which makes the world seem much richer. Take your time and explore. This might be the most important tip: Mankind Divided isn’t actually all that long of a game, but you can get a lot out of it if you just slow down and take your time. From the very first time you arrive in Prague, take in the sights and explore. Talk to civilians. Listen to people talking on the street. There’s a lot you can experience just in the opening district of the city. In fact, keep that mindset even while on story missions. You may be in hostile territory, but there’s still a lot of interesting stuff for the curious player to find. That’s what I’ve got for now, though I’m sure I’ll update this post as I keep playing and think of more tips. If you have any tips of your own, I hope you’ll share them below.